(Carnival is 11 am-4 pm). 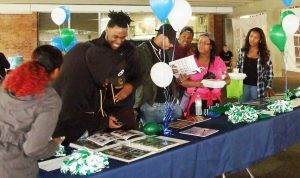 The special tailgate for alumni from 1-3 pm will include music, food, fellowship and a walk down memory lane…..
$5 donation at the door (with options to be sponsor). BYOC (bring your own chair). Please share the NEW Facebook group for All Saints Alumni. Alumni Tailgate 5_5_18 – Event flyer; please share! Calling all ASCS graduates and former students: join us for a “tailgate” party at the school’s annual Spring Carnival at the school on May 5th (Carnival is 11 am- 4 pm). The special tailgate for alumni from 1-3 pm will include music by DJ LonnieB, food, fellowship and a walk down memory lane. More event information on the Facebook page Please share the Facebook event and the NEW Facebook group for All Saints Alumni. Get a ticket for a $5 donation below (with options to be sponsor). BYOC (bring your own chair). 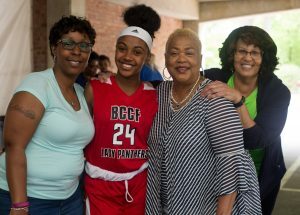 All Saints Alumni help form new Benedictine Black Alumni Chapter. Check out their website at www.benedictineblackalumni.org for more information. 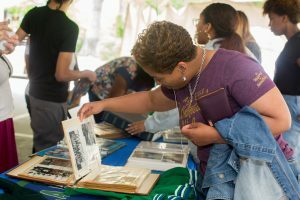 All Saints alumni gathered Saturday, May 6, under the carport to visit and take photos with fellow alums, revisit yearbooks and photos from their class. Want to help with next year’s gathering? Contact Alyssa McBride at amcbride@allsaintsric.org or 804 329-7524 x 108 for more information. The 2018 Spring Carnival will be May 5th. Please help us spread the word to other alumni! 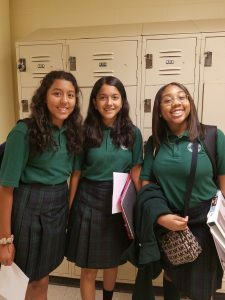 Attention Alumni of All Saints, St. Paul’s, St. Elizabeth’s, St. Patrick’s, Van de Vyver Catholic Schools and all those who celebrate the tradition of Catholic education – the All Saints’ sponsored “reyounion” will be held again in the fall of 2018. 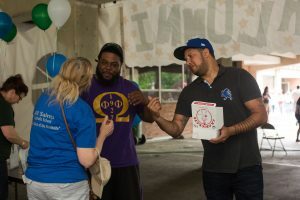 To ensure you are on the invitation list for the next reyounion, send your contact information (name, full address, e-mail address, phone number, school and year of graduation) to allsaintsreyounion@gmail.com or mail to 3418 Noble Ave., Richmond VA 23222, Attn: Alyssa McBride. Regular updates can be found on this page. Thank you! Every year, Benedictine cadets bring lunch and visit with our 8th grade boys. Among them are several All Saints alumni. We are proud of our alumni! 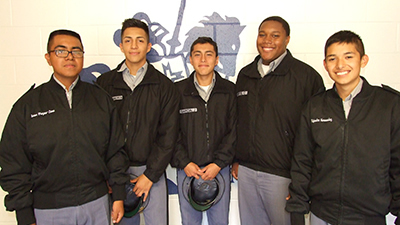 In January of 2016, five ASCS graduate cadets answered these questions about their experience at All Saints. See their individual answers below. 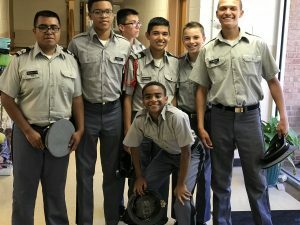 The cadets report to us that they are working hard and doing well. They appreciate the foundation they received at All Saints. 1) What was your most memorable experience at All Saints? 2) How did All Saints prepare you for Benedictine? 3) How are you doing now (please brag! awards? grades? sports?)? 4) What are your plans after high school? 5) Now that you have graduated from All Saints, what advice would you give current All Saints students? 1. My most memorable experience would be when I ran for Vice President and won! I never really thought I was going to win since many of the students didn’t know me very well. 2. All Saints prepared me for Benedictine because it taught me that I have to work harder because life is never easy and you have to work really hard. 3. Life at Benedictine is great! There are no distractions, the class sizes are smaller to ensure that everyone will learn, and we are offered a variety of sports to play. 4. After high school I want to study law and become an immigration lawyer. I want to help those in need especially people from the Latino community who do not have the same advantages and opportunities as us. 5. If you guys are serious about your future and want to be someone then Benedictine is the place to be. 1. My most memorable experience at All Saints was when we went to the Science Museum. I had a blast. 2. All Saints prepared me because I had never had a religion class before attending All Saints. I’m thankful that All Saints did because it gave me an understanding of what it would be like to attend a Catholic high school. 3. I’m doing great. I teach confirmation classes at my Catholic parish and I could not be any happier than I am now with my life. 4. After graduating Benedictine, I hope to attend college where I will continue studying theology and learn to be a nutritionist. 5. My advice would be to do your best to succeed, and even when you fall, get back up and keep trying. 1. My most memorable experience at All Saints was starting the soccer program in my 8th grade year. The program still goes on to this year. 2. All Saints prepared me for Benedictine by giving me lots of projects and homework to do to help me develop a strong work ethic. 3. I have made 1st honors here at Benedictine and started on the varsity soccer team since my freshman year. I am currently taking AP classes and have a leadership position as a Sergeant First Class in the Cadet Corps. 4. I plan to attend a college where I can play Division 1 soccer and possibly study something in the medical field. 5. The advice that I would give to current All Saints students is to work hard and keep going, no matter how hard it gets, because in the end everything will pay off as long as you put the work in. 1. My most memorable experience at All Saints was the Christmas play. In my opinion, the Christmas play was what I always looked forward to as a student at ASCS. Practicing and preparing for it always got me excited for Christmas and during that time of the year, everyone always seemed so happy. 2. The teachers at All Saints always told me that going into a prestigious school like Benedictine was not going to be easy…they were right! They all helped me develop good habits to get me started on the right track, and they also helped me develop good study methods. 3. I am doing absolutely amazing right now! I have made so many new friends since I walked through those doors 3 years ago. I have grown stronger in my Catholic faith, and day by day I’m working on ways to stop acting like a rowdy teenager and trying to become a better man. 4. After high school I plan to go to college and join a military corps of cadets. I hope to major in engineering. After college I plan to graduate from the corps and go into the United States Air Force as an officer and hopefully become a fighter pilot or an aircraft technician. 5. My advice is that when things get tough, never give up on yourself. Keep doing your homework and keep studying. Always listen to your teachers, because they are definitely there to help you. Once you do these things, there’s no telling what you could do and where you could go! 1. 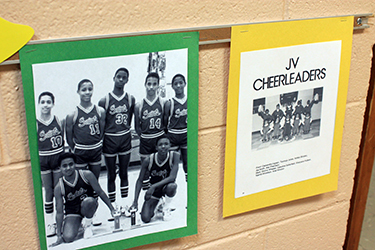 There were several memorable experiences at All Saints…winning the championship in Soccer, the Christmas play, and my Graduation are the ones that really stand out. 2. All Saints prepared me for Benedictine by helping me appreciate learning and by teaching me how to build good friendships with others. 3. I am doing very well…I got an A in my military class, a B in my theology class, and a B in my Spanish class. I also played on the Varsity soccer team. 4. After Benedictine, I plan to go to college to study engineering or computer science and hopefully continue to play soccer. 5. The advice that I would give to the current All Saints students is to enjoy your time at All Saints because it goes by fast especially for the 8th graders. Thanks for including us in the exercise.